Open the Exchange Management Console and navigate through the console tree to: Organization Configuration -> Hub Transport. message containing the word Contoso to a specific mailbox. With the Hub Transport container selected, click the New Transport Rule link in the Actions pane. Windows will launch the New Transport Rule wizard. Figure 9: Enter a name for the rule that you are creating. Verify that the Enable Rule checkbox is selected, and click Next to go to the Conditions screen, which allows you to set the conditions for the rule. Select the When the Subject Field or Body of the Message Contain Specific Words checkbox, and you will see Specific Words as a hyperlink at the bottom of the screen, as shown in Figure 10. Figure 10: You must click on the Specific Words hyperlink and add Contoso to the list. Click on this hyperlink and add the word Contoso to the list. Click OK and Contoso will become hyperlinked. Click Next to go to the Actions screen, which lets you control what happens when a message fits the criteria defined in the Conditions screen — when the message contains the word Contoso. BCC the message to the Address box; the word Address is hyperlinked, as shown in Figure 11. Click on this hyperlink and replace the word Address with the path of the designated mailbox. Figure 11: Specify the name of the mailbox that you are using as a message repository. the message as something that must be archived. When you select Prepend the Subject with String, the section at the bottom of the screen will display the line Prepend Subject with String. In this line, the word String is hyperlinked. Click on the hyperlink and enter the words Contoso project. This will add these words to the beginning of the subject line of any message that mentions this project. Click Next again and you will see the Exception screen. We don’t want any exceptions to the rule, so click Next to bypass this screen. You will see a summary of the configuration information you entered. 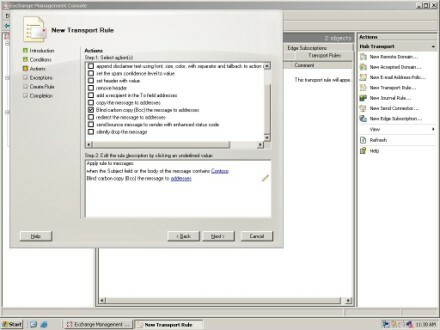 Click New to create the transport rule. When the process completes, click Finish. We have created a rule that will send a copy of any message containing the word Contoso to the mailbox you chose. I have created a mailbox named Contoso on my test system, and use that as a dedicated repository. Log in as the owner of the Contoso mailbox and open Outlook 2007. Select Rules and Alerts from the Tools menu. Outlook will display the Rules and Alerts properties sheet. Before you actually create a rule, I recommend performing an upgrade of the rules engine. So now click Options to display this dialog box, shown in Figure 12. Figure 12: If you’re running Outlook 2007 or newer, you should upgrade the Rules engine. 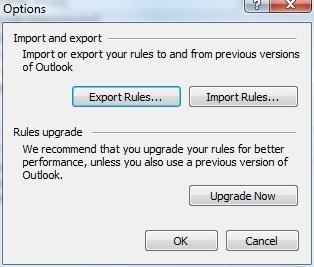 Unless you use an older version of Microsoft Outlook, click Upgrade Now so that your rules perform better. When the rules engine update is complete, click OK to return to the Rules and Alerts properties sheet. Select Move Messages with Specific Words in the Subject to a Folder, as shown in Figure 13. Notice that the words Specific Words and Specified are hyperlinked. 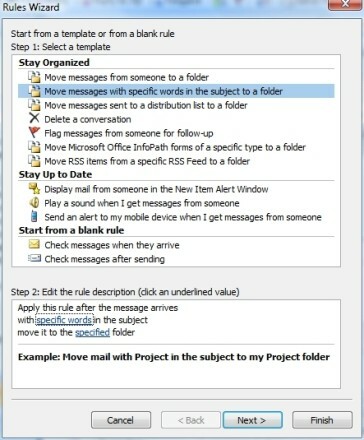 Figure 13: Select Move Messages with Specific Words in the Subject to a Folder. Click on the Specific Words hyperlink and enter Contoso project. Click on the Specified hyperlink to see a list of all available folders. Select the Contoso folder and click OK.
Click Finish to create the rule. There are a couple ways to create a managed folder and use it as a repository for copies of messages related to the Contoso project. retention policy and necessary folder permissions. you select, rather than to a managed folder.